Is 2018 the year you give your bathroom a makeover? If it’s been a while since you’ve shown your bathroom some love, then it’s definitely time. You spend a lot of time in the bathroom–some estimates put a total of 18 months of your life spent on doing your hair alone–so you might as well make it a great place to be. When you are looking for inspiration for your bathroom makeover, make sure you take a look at some of the trends for bathroom tiles. It’s a wonderful way to set the stage for the rest of your bathroom makeover and create a cohesive look that you’ll be proud to show off. We’ve been helping San Fernando residents find the right tile for their bathrooms for more than thirty years, and we’ve seen a lot of trends come and go. Here are some of the best ones we see coming in 2018 that will have the staying power you need for a bathroom makeover that you’ll love for years to come. One of the biggest trends that we’re currently seeing in bathroom remodeling is the use of bold graphic black and white tiles in the bathroom. These are in use either on the floor or the walls (rarely both) and combined with a clean neutral pallet to help the graphic pattern pop. It’s inspired by the Scandinavian influence that’s taking over home decor at the moment, and we love it. It’s a great way to modernize a bathroom without sacrificing your personality since the graphic black and white options can pack a lot of personality without using any color. 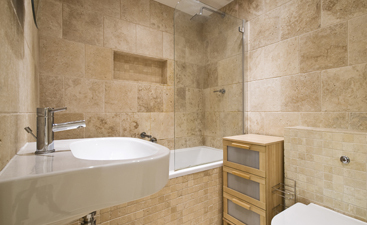 Natural textures are a great way to warm up a bathroom. 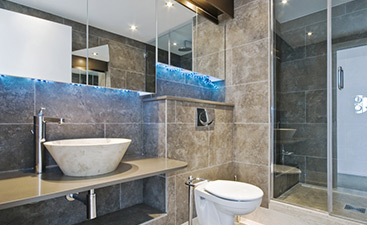 Sometimes bathroom design can start to feel a little cold and impersonal, with all the white and polished surfaces. But added in natural textures like stone and wood is a great way to bring in some nature and add some interest to the bathroom’s space. One catch, though: a lot of the natural textures that you’ll see in 2018 bathrooms aren’t actually so natural. Wooden textures are often actually porcelain tiles that have been patterned to look like wood. 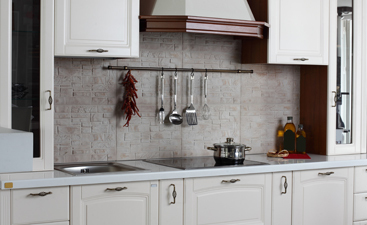 It’s a great way to add the warmth while still maintaining the easy care of a tile surface. You get all the moisture resistance along with the beauty of wood. Where is there tile located in your current bathroom? Chances are it’s only the floor and maybe around the shower, possibly behind the sink. But the newest bathroom designs are expanding the reach of tile by taking it up the walls. 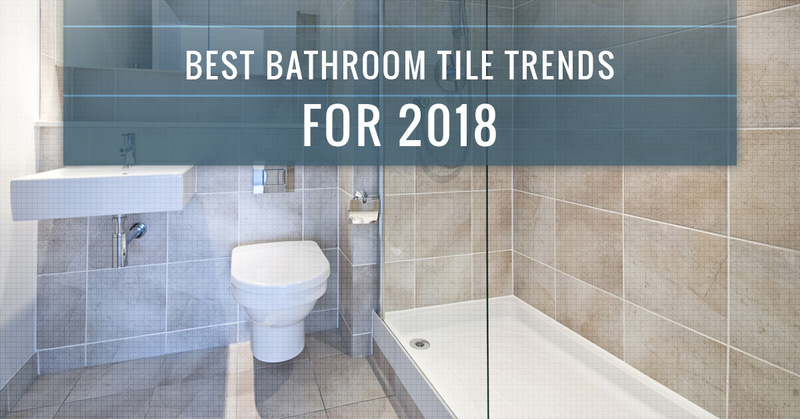 In fact, we’re seeing more tile in bathrooms than ever before. Today’s bathrooms are being covered in gorgeous tile surfaces from floor to ceiling, and we love the way that it looks. It makes sense for the bathroom, too, since tile is ultimately much more moisture resistant than your plaster or drywall surfaces. It’s simple to clean and you won’t care where the spray from the shower ends up going. It might be more of an investment, but the final look is absolutely worth it. The color palettes in 2018 bathroom makeovers seem to be more neutral than ever. This is also influenced by Scandinavian design, which focuses on creating highly functional spaces with beautifully neutral color palettes. For this clean and classic look, go for black, white, gray, and earthy tones like taupes and browns. This kind of color palette instantly makes a bathroom look clean and peaceful, and who wouldn’t want that in their bathroom? You’ll find plenty of bathroom tile options to help you achieve the look in our online store. Don’t get too carried away with the neutrals, though. Overdoing it can leave you with a bathroom space that’s lacking in personality. To counter that effect, make sure that you pop some pops of color to go with the mix. It’s a classic trend that we’ll see carrying into 2018 and beyond. You can bring that pop of color into the space in a number of ways. Consider adding glass tiles that offer a focal point of color or choose towels that share your personality. You can also bring color in through plants, adding greenery or flowering plants that are bathroom friendly (they’ll love all the moisture in the air!). Which Trends Are You Incorporating into Your 2018 Bathroom Makeover? Feeling inspired by this list of tile trends? We’d love to see what you do to your bathroom! If you end up using Transworld Tile’s products and services in a bathroom this year, we’d love to see what you’ve done. Send us a photo via our website or find us on social media. We might share your photo in a future blog post! We can help bring your bathroom makeover ideas to life. Get in touch with the Transworld Tile team today! We offer a huge selection of bathroom tiles that are perfect for your space, whether you need a little bit of tile to bring in some color or enough tile to recover your bathroom, floor to ceiling. You’ll find a great selection, great prices, and a staff that’s friendly and helpful. Get in touch with us today to learn more about our tiling services by giving us a call or contacting us through our website.